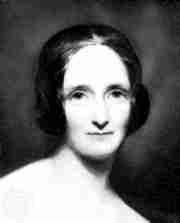 Comprehensive information about Mary Shelley including biographical information, facts, literary works, and more. Mary Shelley, born Mary Wollstonecraft Godwin, was an English novelist, short story writer, dramatist, essayist, biographer, and travel writer, best known for her Gothic novel Frankenstein: or, The Modern Prometheus (1818). She also edited and promoted the works of her husband, the Romantic poet and philosopher Percy Bysshe Shelley. . This educational Mary Shelley resource has information about the author's life, works, quotations, articles and essays, and more. Articles about Mary Shelley or articles that mention Mary Shelley. A Mad Scientist, Mad Generals, and a Doomsday Machine: The Iconography of Science Fiction in Stanley Kubrick's "Dr. Strangelove"
Here are a few random quotes by Mary Shelley. My dreams were all my own; I accounted them to nobody; They were my refuge when annoyed - my dearest pleasure when free.